Engine number range KZ305AE000001 - 010100, found on RH top crankcase, below carburetor. 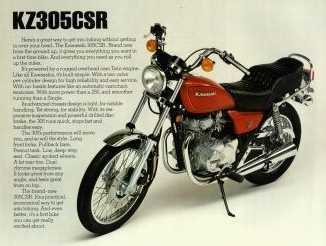 Engine Type 4 stroke, 2 - cylinder, SOHC, air cooled. Brake Type Front Single hydraulic disc - Oil Pump Check Remove oil galley plug above LH spark plug, with engine idling, oil should flow from galley.